Happy creative artist holding paintbrush in hands and posing on camera with her masterpiece. Young creative artist holding paintbrush and color palette while working on oil painting. 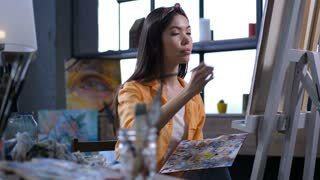 Talented pretty female painter holding palette with mixing acrylic paints creating artwork on easel at her art studio. Inspired woman artist drawing her future masterpiece in creative workshop.